Why I’m tired of hearing about Johnny Manziel. 1)I don’t hate Johnny Manziel. 3)I think Johnny Manziel is talented. 4)I think A&M is a good school. If you’re going to read on, please keep those 4 statements in mind. A myriad of posts have flooded my news feed with the start of college football. I have a lot of friends who are Aggies, so naturally quite a few have to do with their star quarterback. But even before that, news of Johnny popped up…as he kept doing things to get himself in the news. 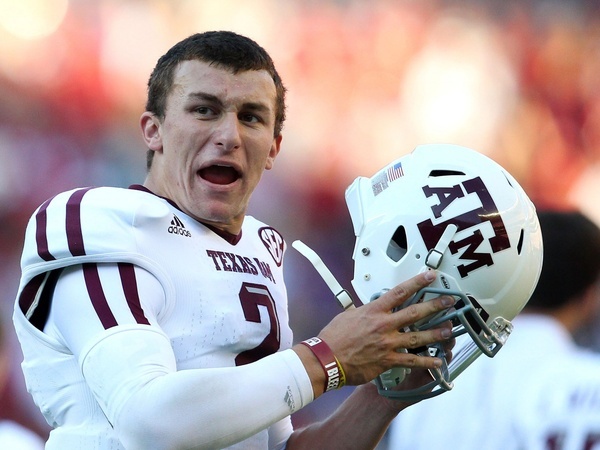 An Open Letter To Johnny Manziel For the most part, this one does not bother me. It is a mother writing a letter to Johnny telling him how people look up to him and how he should start playing the part. I agree. I think Coach Sumlin agrees. I’m an Aggie Before I’m a Christian This one bothers me a lot. First of all, to say you’re an Aggie before you’re a Christian is a wrong in my book. I mean you can be, but I’m not sure you’re in the place to write that article then, as it mentions quite a bit about faith. If you profess to be a Christian, it should be the basis of all things-definitely coming before your alma mater. It also mentions grace. I agree- we all have the opportunity to bask in God’s grace. Ephesians 2:8-9 says that. Ephesians 6:24 also says something similar. Notice it says that grace is given to those who love Christ. I’m not saying Johnny doesn’t love Jesus. I’m not saying I’m better than him. I’m not. I am saying that loving Jesus involves wanting to be more like Him and striving for your actions reflect that. That’s Biblical. Obviously no one is perfect. I’m not perfect. I mess up all the time. This article talks about how we need to give Johnny grace. I think he is past his grace period from humans…he’s more on a “keep tabs on him at all times” state right now. (That doesn’t mean mock him in a church. Absolutely not). There’s a reason Sumlin won’t let him talk. I think he is pretty smart to keep it that way. Everyone is welcome to receive God’s grace, but not everyone wants to partake. Johnny’s actions don’t reflect any change or desire to change. The only constants are his magic with the football on the field and his ability to make the wrong choice, at the wrong place, at the wrong time. The Johnny We Know This one makes me want to roll my eyes roll my eyes. It’s basically a conglomerate of photos of Johnny doing good deeds. People are saying things like “I’m posting this since the media won’t” or “Yep. This is our Johnny- Keep it up!” I don’t think you actually want to him keep this up. You know why the media doesn’t post things like this? Because Mr. Football doesn’t make it believable in his current state of life. These are all sweet things, I’m in no way denying that! I’m just saying that a couple good deeds and publicity stunts aren’t going to get everyone to love you if you aren’t acting that way on and off the field. A blurb from the coach in this article, said it best, I think. Most recently, Johnny upset crowds with his show me the money sign. It was a little too soon for some. Sure. He did it last year, but not everyone knows or remembers that. It doesn’t bother me that much that he did that; however, it wasn’t really the appropriate time to do so, as he had just been released into the game after a half game suspension because of the “autograph scandal.” Any publicist could tell you that. In reality, this was just icing on the cake, for those already angry. One thing my dad said, was that the court of public opinion matters. The instance above is the perfect example. This is America. He has the freedom to do that. You know what? So did the Dixie Chicks. Looked what happened to them…completely taken off the air. Why? Not because the radio wouldn’t play them, but because people went crazy in protest and even bulldozed albums. Johnny hasn’t done anything quite like that, but talk about a lot of talent gone to waste. I’m afraid that that’s what will happen to Manziel. It’s still too early to tell if anyone will want him in the NFL. He has proven to be volatile and to not make good decisions- something you don’t want in a pro QB. I don’t mind watching him play football. I don’t mind hearing his stats. (Nothing will change my mind of the fact that I think RGIII is better:) I’m just tired of everyone trying to make him into something he isn’t. I honestly think he is too. In all fairness, he does have a lot of pressure and eyes on him; however, that should make him want to be better. It’s a bit alarming that it doesn’t. Perhaps some day soon, he will finally start listening, but until then, good luck. Actions will always speak louder than words and sometimes can bring you to your demise, no matter how much God-given talent you have. Unless he shapes up, A&M will continue to be seen as the villain in college ball and people will continue to root for them to fail. Though they had quite the Cinderella story last year after joining the SEC, this year they have transformed roles into the ugly stepsister. p.s. if you’re mad at me right now, just review my first 4 points. If you’re asking what school I went to, yes. I graduated from Baylor. Even if I had gone elsewhere, my opinion would still be the same. Quite frankly, I’m just tired of all this Hullabaloo.